Here is the latest version. What is new you ask? The main new thing is the ability to batch submit your spammers/bots to BotScout Every 200 submits to BotScout there will be a 2 second pause... Added a error viewer to the batch submit, if there are any errors in submitting, click the icon above "skipped" to see the reasons... plus a few more things were fixed..
or use "Check for new version"
Beautiful! Makes it easier to do my tests to see if they were submitted correctly and then I can remove em! Thanks! Here it is, the latest and greatest - Forum Spam List Checker version 3.0.2! 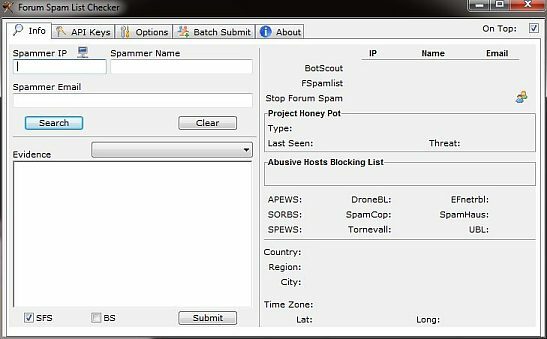 Forum Spam List Checker will allow you to query several databases (Bot Scout included) and return the number of time the IP, User Name, and Email Address was submitted, and allow you to decide to ban the user / deny registration. FSLC will also allow you to submit the spammers info to Bot Scout and Stop Forum Spam! Aren't ya glad you nightly backups?! Many posts visited the bitbucket I see. Glad we are back up though!